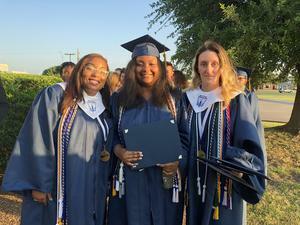 Congratulations to Advantage Academy's 2018 Valedictorian Ashlyn Ingle, Salutatorian, Jasmine Williams and Soaring Award winner, Ashlyn Ingle. Each received a $500 college scholarship from Advantage Academy. 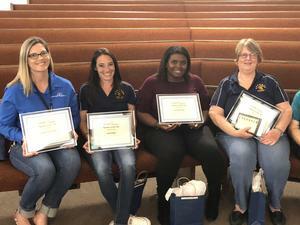 Teachers and Employees of the Year! The 2018-19 school calendar is now available. Hard copies will be available in each campus main office by the end of June. To download a PDF version to view or print click the link below. The class of 2018 graduation will be held Friday, June 1, 2018 at 7:00 pm in the Grand Prairie East Auditorium located at 300 W. Pioneer Parkway Grand Prairie, TX 75051. Morning show host Armando "El Chiquilin" from 107.5 La Grande will be there Tuesday, May 1st to meet parents and students for our PK-8 Math/Science Night. Prizes, face painting, slime and fun math and science activities. Read more to download the map and flyer. 2018-19 New Student Online Enrollment Open Now! We are excited to announce our new online enrollment process using SchoolMint. It's never been easier or quicker to apply through the mobile friendly site. Select the link below or under our admissions tab to apply now for grades PK-12 for the 2018-19 school year. SchoolMint also has an iOS or Android app available. Our High School DECA team was awarded an Achievement Level pennant and a certificate. Join us in congratulating all of our 26 members for their hard work on the community service campaign that earned us this honor. Advantage Academy Literacy Committee has been created recently to help identify how we help students with authentic literacy. The purpose of the literacy committee is to help Advantage Academy students develop a strong foundation in reading, listening, writing and speaking in order to build literate students for a successful future. This is a need which affects comprehension and learning problems in all subjects. This spring, the committee is meeting monthly to problem solve and determine ways to encourage real reading and writing in every classroom and establish clear expectations for every grade level in reading, writing, and research. In addition, the committee is reviewing current resources and recommending new ones for high need areas. The enthusiasm is high and contagious. Educators at Advantage Academy want to radically make a difference to improve student learning.